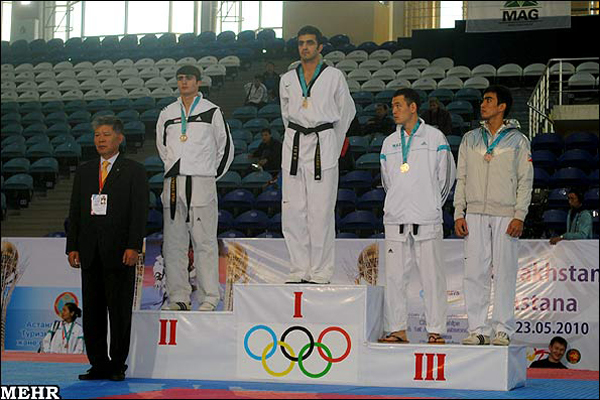 Iran claimed the title of the 19th Asian Taekwondo Championships on Sunday. Defending champion Iran came first with 59 points bagging four gold medals, one silver and one bronze in Astana, Kazakhstan. South Korea finished runner-up with 42 points with two golds, two silvers and one bronze. Thailand came third scoring 33 points and bagged two gold medals. A total of 210 participants from 20 countries including South Korea, China, Thailand, Iran, Jordan, Afghanistan, Japan and the Philippines, took part in the four-day event which ended on May 23. Source: Mehr News Agency, Tehran.